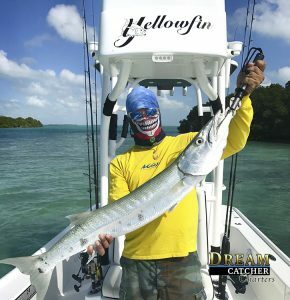 April 2nd 2019 – I waited till today to write the April inshore Key West fishing report and forecast so you all would not try and read into any April fools jokes. The weather these last few days has been remarkable. Traditionally I am usually talking about how sucky the East winds have been. This week looks like great weather for backcountry inshore fishing. Barracuda Caught on board our Yellowfin 24 Tower boat with Capt. Tommy Z of Dream Catcher Charters. Flats fishing has been really good for this time of the year. Lots of bonefish are being reported from our fishing guides along with a good number of permit. Not unusual to find permit this time of the year, in fact, March is has always been one of my favorite months for permit fishing here out of Key West. Bonefish however, in the years past a day of fishing for them could turn up a few fish but these days it seems our bonefish populations have exploded and offering us a great fishery for most of the year. Looking at the long range forecast and the way things are setting up. North Carolina just got hit with a snow today. April is late for that strong of a cold front so that tells me we are in for some more mild weather here in Key West as winter like conditions continue up there. It looks to me like The spring time winds will hold off another couple of weeks. Be sure to know.. They will just be holding off. I am certain they will come, its just a matter of when the Eastern seaboard high pressure sets in like it does every year. Shark fishing is also getting really good. The bull sharks and lemon sharks have started to spawn and make for a huge fish target to go for in the shallows. There are few things more edgy than sight fishing a 300lb bull shark. A really fun Key West fishing charter.. This week the new moon is coming. That will stretch out our tides moving lots of water in and out of our Key West waters. A great time for the tarpon to get happy, the bite should be an all day event. On the flats fishing we will continue to see summer-ish conditions with barracudas, permit and some bonefish. The backcountry fishing will be a great way to go as usual for those wanting to bend a rod and have a nice pleasant day on the water. Backcountry: The shallow water flats and channel areas that are within the islands of the Florida Keys. Calm, clear, peaceful and very pretty. Backcountry Fishing Charters: The act of fishing in the backcountry. Private fishing charters with 4 persons or less and the captain. A great way to target tarpon, sharks, barracudas and jacks. All skill levels and ages. Flats Fishing Charters: A Key West fishing charter for 2 or less that is done in the backcountry with a focus on the Key West grand slam. Tarpon, Permit and bonefish. spin fishing and fly fishing skills should be present. To Learn More About Key West Fishing Or To Book A Trip..